Enfield with heart of a Yamaha 650 twin. Update: This item has sparked discussion of homemade Royal Enfield twins, Yamahas, parallel twins and V-twins. Check the "Comments" link at bottom to get in on the conversation. "Sorry but I couldn't wait for a parallel Bullet so I modified mine. I like it specifically because it's NOT another V-twin and all the hoopla that goes with 'em," wrote Gerry from Washington state. He attached this gorgeous picture of his Bullet with its parallel twin, transplanted from a Yamaha 650. The picture is out of date now, as Gerry has continued what he jokingly calls his "sacrilegious mods" to his Bullet. Also out-of-date but still inspiring is this Youtube video of Gerry taking a brief run with the then still unsorted Yamaha Bullet. "Bought a parts bike for $100. Original Enfield motor with very high millage, still intact. Rebuild might have been cheaper, however this one can cruise all day at 90-100 mph after I put the Yamaha swing arm and rear wheel into it. Gerry and his Enfield-Yamaha twin. "This thing buries the speedo needle with ease and accelerates like a GSXR 750 and shoots right over the Rocky Mountains like a cannonball." 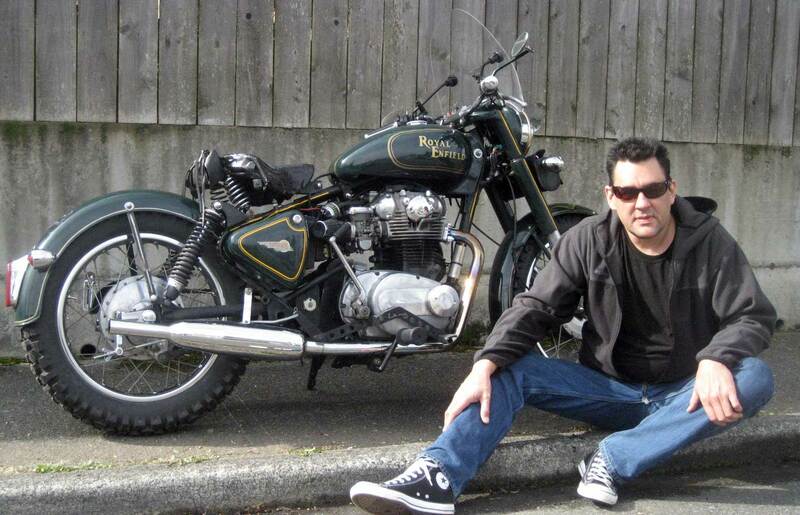 He credits fellow bikers on the Royal Enfield Forums with helping along the way and inspiring him to keep going. "Learned much from the good people there," he wrote me. 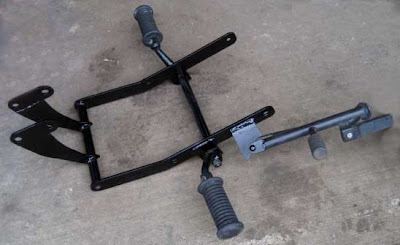 One picture on the Forum shows the subframe made for his Bullet twin. Custom cradle supports motor better than brackets alone might. "This was made to enclose the gap in the frame that is normally underneath a Bullet motor and transmission. Its purpose was to provide extra support to the front down tube, neck and back bone. Also provides a fifth 'engine-to-frame' mount and a spot to hang the Enfield footpeg assembly." In comments on the Forum, Gerry expressed doubt that Royal Enfield itself could ever successfully sell the fast parallel twin he wanted. How could an Indian twin overcome the Brit-bike snobs and the American prejudice for V-twins, he asked? Besides, he noted, there is no shortage of reliable old Japanese motorcycles available in the U.S. to meet any demand for conversion to fast café racers. 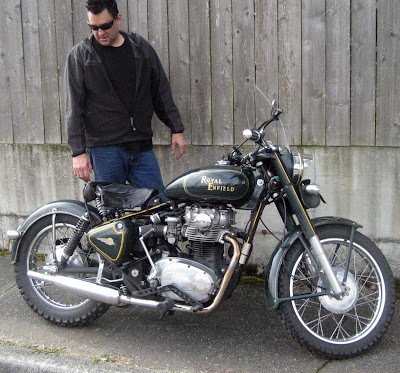 At the same time, he hopes he is wrong about a new Royal Enfield twin someday coming to America. "I would like to build another single using the Ace/Chumma Fireball and yes: if I can afford it would LOVE a new stock twin." As for what he did being sacrilegious, he's prepared to take the criticism. 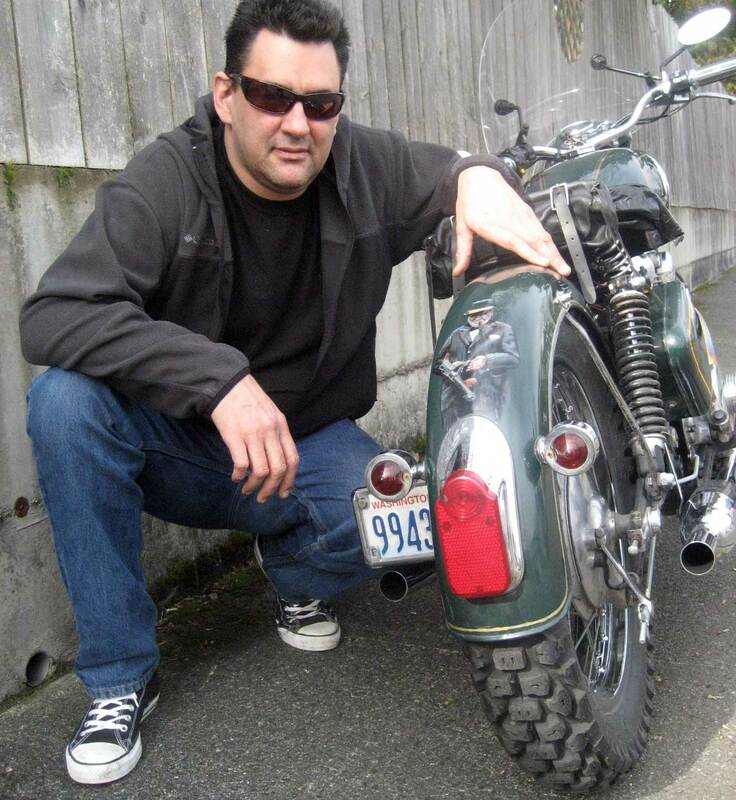 Still, "don't think I would have stuffed a XS650 motor in a real '58," he wrote on the Forum about such a bike on eBay. Winston Churchill packs a Tommy gun on rear finder. As for the future: "My plan is to ride the hell out of my Bullet and keep messing with that for a decade or two." Looks great! 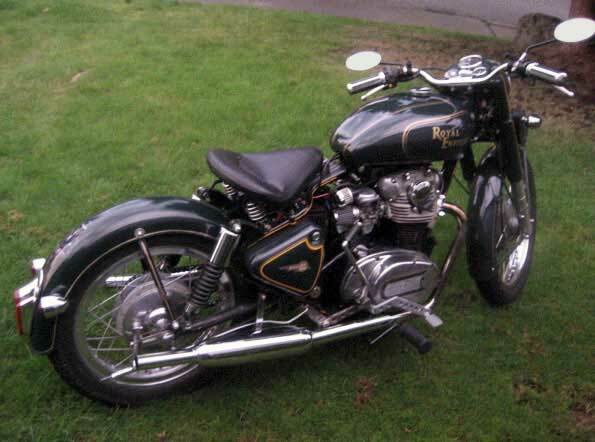 I hope Enfield releases twin engines that can be purchased separately to fit into my Classic Bullet. As much as I appreciate the new Bullets, I'd really rather just keep mine, drum brakes and all - a twin engine would be a perfect mod! that is a gorgeous machine, great job! Not "sacriligeous" as neither donor machine is "sacred." So it's a no-harm no-foul deal as far as I'm concerned. Thank you, Gerry, for making this motorcycle happen and then being willing to let everyone else see what can be done. Fantastic job Gerry! You put together two of my favorite bikes- the Yam 650 and the Bullet. I have 3 Yam 650s which I think have the same addictive 'just-rightness' as the Bullet. Even though you don't like V twins, I do hope the Musket v twin (with a Fireball job) may meet with your approval! All the best and enjoy your ride. the XS650 happens to be the most beautiful motor according to me. clean, balanced and proportionate. i wish they had built the new UCE as clean and balanced. i see too much clutter in it. hope RE makes the new twin motor a parallel one as opposed to the V, and hope it looks as good as the XS 650 motor. that said, what you have made is the best of both worlds. the bike looks awesome. absolutely perfect. I'm glad you like. The resurgence of the XS650 is cool to watch isn't it? While "American built" bikes continue to rise in cost with few innovations the home built alternatives really become a necessity. Manny very interesting projects will fill the vacuum and I enjoy seeing the creativity. I myself robbed this idea from an unknown mechanic who has done this before. Maybe it was for the best I couldn't ask him directly how to do it seeing only that it could be done. Was all a matter of the timing for me as my main mode of transportation was running up in mileage. Still happy with the results and appreciate your comment. Long live RE's XS650's and all other alternative bikes. Hope David doesn't mind us yapping about a non-Enfield on his blog! Have to tell you guys my 650 tale- 2001, just finished gradschool, no job, 9-11 had happened, times were really tough. I was in L.A., staying with my bro, looking for design jobs, seemed like the worst time to be looking. And my dream of having a cool old bike with a twin cylinder motor was evaporating. Months of scoring the classifieds for an XS (the only truly classic twin for not much money) finally led to an ad for one in La Habra. It was a LONG bus ride away, I was new and clueless, got off at the wrong stop WAY too early, ended up walking about 8 miles, quite lost. Finally got there, it was in a trailer park and was in complete shambles. Had no brakes, no signals, no exhaust, no ignition...but after that walk, I was just too annoyed to walk away. So....it became mine for the grand sum of $150. Months of frugal Ebaying later, it was done, on a very tight budget. Ran great, but a bit rattly in the top end due to loose pistons. Blissful rides with wide grins down Sunset Boulevard...aah, felt like being inside a movie. Got a job in Columbus, had to move, left her behind with my bro.- no money to ship it. But...a few months later I did! She came from L.A. to Columbus on a truck, got her pistons replaced and is still running great, 10 years later. Thanks for putting up with us David. I can't pass up the chance to chat with Aniket. I'm amazed at what people can do on a shoestring and your story is no exception. Your engine case design utilizing Royal Enfield parts is genius. I had a couple questions about the rods...did you use a longer rod journal (and widen the cases accordingly) and use 2 alpha bearings? Will the crank line up together in the RE flywheel tool? Awesome configuration on the valve train by the way. I am hanging on to my old motor and 4-speed. It has well over 20,000 miles on it but still runs. I keep scouring the local net for a 500 with maybe a a blown bottom end. Then I would have 2 top ends, trans and a chassis, with the idea of having real extra money someday...who knows. Your v-1000 would make the best sidehack hauler. Enfields are mostly touque. Without the fireball set up a v-1000 would have say 45 ft lbs at around 3500rpm ? I do like the fact that your making the engine case available as a part or kit. Will you also be offering complete engines? If Royal Enfield builds the next twin as a parallel do you see any potential for upgrades or possible designing high performance parts? I guess we will have to wait and see what comes out. Damn...ugh...I suppose thats more than a couple questions. Its just that I been watching your progress for so long. Sorry, couldn't resist. Ask all the questions you want! I'm so sorry if I missed replying to your email- please write again, I will be glad to talk! 1. Yes, a longer crankpin was made to accommodate two conrods. The 700 prototype that I'm currently running was all stock- so the rods are the alloy ones and the big end is the bush- this was primarily because of budget reasons. Ofcourse, the motor can be assembled with carillo rods and alpha roller bigends too, depending on the customer's requirements. I haven't used the RE flywheel tool- I trued it up in the traditional way on a lathe, so I can't say. Just factor in that the flywheels are about 1" further apart compared to the single. I'm certainly going to do all I can to accommodate different requirements, incase someone wants a complete assembled motor, and later on, perhaps even do the whole installation and frame mods, which would require the bike or frame to be sent to me though. Great to talk with you and write any time! Hi, just had a view. it's a lovely beast. As you said speeding like a cannonball. see, enfields are OLD bikes on indian markets now. new enfield market is made for bourgeois kids, upper class pune or mumbai flock. many of them transformed their RE and said " I try to keep it a close to the original". But WHO told you you had to do or think like that. Do you know the job of anicket vardhan. He created a new srank box with two engines, 700cc now 1000cc and selling kits guys. Well, the guy want the bike look like the original. He even started to give it the name royal enfield (now found the musket name). hell with original enfield shape. Enfield itself has evolved and modified models. Who are we to be more royal than the queen. go F 'em all, RIDE IT.